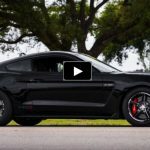 Boost12 Twin Turbo Mustang Dominates Small Tire Class! The well known Chicago grudge racer Boost12 showed up at the Shop Inc’s Heads Up No Prep drag racing event with his angry New Edge Cobra Mustang “Damn Girl” to prove once again that he ain’t scared of anybody at the track (besides the track itself perhaps). 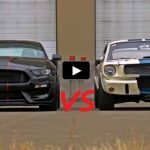 Boost12 and his outrageous twin turbocharged Cobra Mustang beast totally murdered the competition and won the Small Tire class with an epic race against a Nitrous breathing Fox Body. The crew seems to be happy with the victory and I hope to see more of this nasty Ford Mustang soon. Check out the 1320video and don;t forget to smack the share button below!